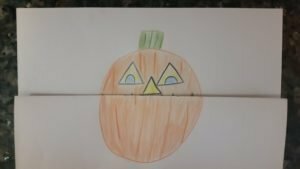 Looking for a fun Halloween craft? Look no further, because this cute pumpkin Halloween craft is a sure crowd pleaser. This craft is fun and easy to do. It’s a great craft to do with a group or individually. The kids will love making scary teeth on their pumpkin. 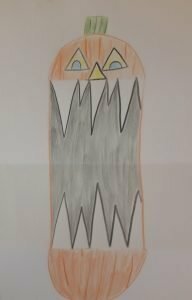 Is it a pumpkin or a monster? You decide! Follow the step-by-step directions below to make your very own Monster Pumpkin! Tip: Love your monster pumpkin? Instead of a pumpkin draw a monster, werewolf, animal, ghost or what ever your creative mind can come up with. Step 1: Hold your construction paper long ways and fold it in half. 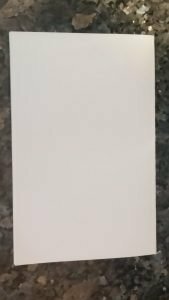 Step 2:Hold the paper so that the fold crease is at the bottom. 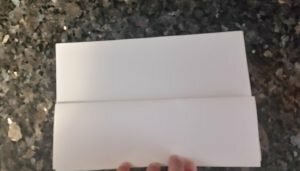 From the top, fold down the top layer of the paper so that it touches the fold. 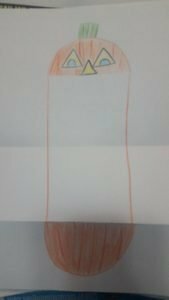 Step 3: draw a pumpkin in the middle of the paper. It needs to be in the middle of the folds on the paper. Step 4: Open the paper so that it is long ways. Draw lines going down on each side of that the line connects that top and bottom of the pumpkin. 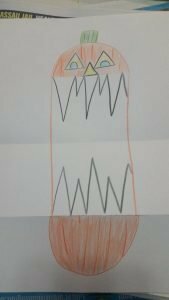 Draw monster teeth for your pumpkin. Step 5: Fold the paper back up. Now it looks like a cute little pumpkin, open it out and it’s a monster pumpkin. Instead of a pumpkin you can draw a monster, animal or whatever your creative mind thinks of.